A few years ago as my mother was cleaning old documents from her home office, I was gifted a trove of childhood treasures: drawings and essays from my elementary school years that made the difficult journey home from school in my backpack in once piece and caught my mother’s eye. I think a lot of parents struggle with knowing how to separate important keepsakes from typical backpack papers that follow a child home from school. My mom gets some serious kudos for the foresight to save quite a few drawings and miscellaneous papers from my grade school years, each neatly labeled with the school year in the corner. 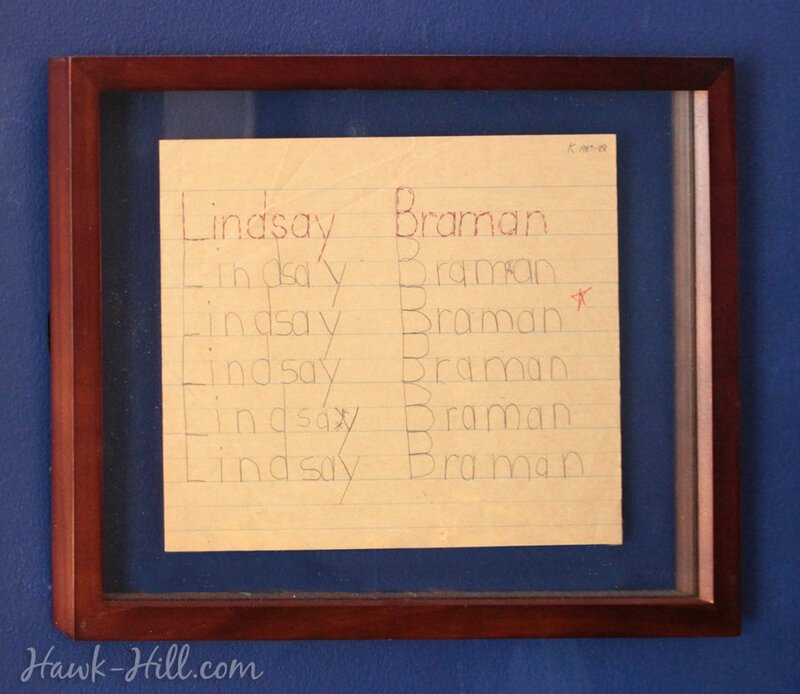 While imaginative drawings such a “cupcake bird” and “dogs in a jar” (names assigned by me in adulthood) are my favorite art pieces of my kindergarten year, this simple hand-lettered print practice sheet, pictured below, from kindergarten is my favorite piece of paper in the boxes of paper scraps and odds and ends my mother collected during my elementary school years. As I thought about [this client], I thought about a piece of framed art I carried with me to Washington and have on the wall of my small apartment. 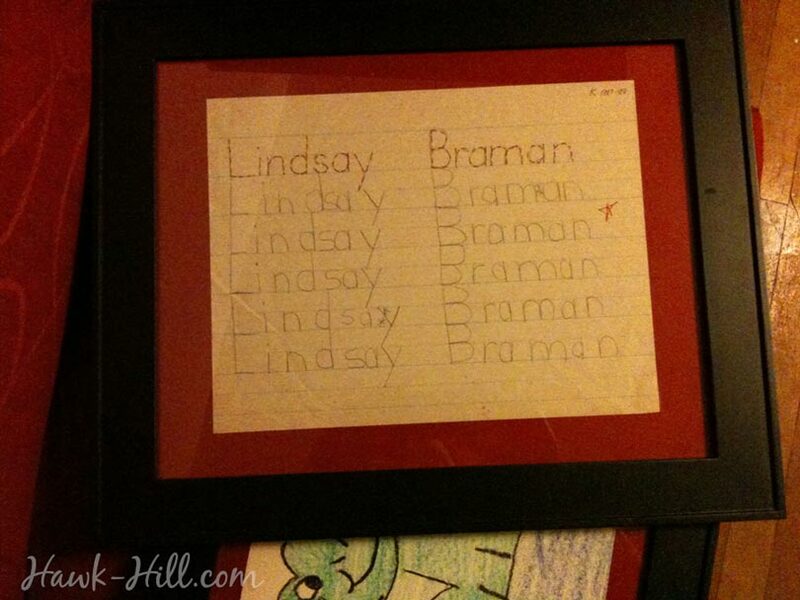 The walnut frame contains a yellowing scrap of paper with my name scrawled many times in a row by my 6 year old self. Headed by my teacher’s textbook handwriting, each subsequent line of my kindergarten penmanship contains errors in letter formation and spacing, but illustrate the early progression towards becoming an artist of words. I keep it close because the reminder it bears is important: With enough practice, effort, and help from others, hard things eventually become easy, and things that seem easy now were once really, really hard. This picture is my hope for my client. In our time together I observed her enter her story and enter the fight for ownership and embodiment of her emotional life. I saw her struggle, I saw her make mistakes, I saw her put effort into the fight, and I saw her come back week after week after week to engage this process and move towards what it could hold for her. My hope is that with practice, the glimpses I’ve had of this client’s full emotional presence will become a rhythm that brings life and color to more and more moments, then more and more days, more and more relationships until being emotionally present is a posture as natural as signing her own name. When I complete my masters work in just a few months, and move into an office, I plan to have this penmanship page re-framed to match the frame I choose for my master’s degree, so perhaps it can be a conversation piece that leads to encouraging conversations. When my niece and nephew begin school in a few years, I plan on recreating this project for them. As they begin to practice forming letters for the very first time, I’ll save a hardcopy someplace safe until a graduation or perhaps a season of struggle in early adulthood. I suspect that, accompanied by a heartfelt note, this gift could encourage someone to keep practicing whatever skill, task, or vocation they are currently struggling in, trusting the process to product skill and efficiency. I love the reminder that this simple page of handwriting practice brings to my adult life: things that are hard don’t stay hard if you practice and accept help. I know many parents now choose to scan and discard children’s art, but let this be my argument for saving paper copies of a few favorites. Theoretically, this project could be created using a high-resolution scanned image of the original document. There is something about this particular page, as it yellows with age, that brings it more to life, and makes a far better display piece as an original than it ever could as a high resolution printout.